Andrew Luck is not quite ready yet. His night ended much like it started on Saturday night in Foxboro: with an interception by Alfonso Denard. Maybe one day, and that day could be coming soon, this AFC Championship game preview will be about him. But the old guard of elite NFL quarterbacks just won’t go away. There will be at least one more big one between Brady and Peyton, and it’ll be on Championship Sunday at 3:00 PM at Mile High. But there was a lot to appreciate about the divisional round result, and for the season as a whole. When Vince Wilfork and Tommy Kelly went down, everyone thought this team would be a sieve against the run. Key members of the linebacking and secondary crews got hurt as well. Aquib Talib, the best cover corner on the squad, fought injury all season, and Alfonso Denard, the opposite starting corner, continues to face legal trouble for a few strange incidents in Nebraska. On offense, the line and receiving corps were decimated, and the presumed star running back caught a severe case of fumbilitis. This is without even mentioning Aaron Hernandez’s offseason escapades, where he left his team high and dry at the tight end position. Rob Gronkowski, the only other skill position player after Tom Brady who you could argue has superstar talent, has earned the dreaded “injury prone” label that is incredibly difficult to shed, and without him, the offense looked to be in dire straits. This season had all the markings of a disaster from the beginning. And it didn’t happen that way. This season could very well could be Bill Belichick’s finest coaching job, and maybe, stats aside, Tom Brady’s most impressive season. I know a lot of fellow fantasy players may scoff at that idea, based on how poor his statistics were comparatively to his best years, but if you take a look at the skill position players around Brady this year, and you realize his team won 12 games and got better as the season went on, culminating in a stomping of a good Indianapolis team, it becomes a legitimate viewpoint. And Belichick? All he did was coax a first round bye out of a team who has a receiving crew of Aaron Dobson, Kenbrell Thompkins, a crippled Danny Amendola, and Austin Collie, and turned Julian Edelman (who enjoyed a spectacular season, despite being no more than a complimentary player for his first few years in the league) into a young version of Wes Welker. And his tight ends? Are you kidding me? Without Gronkowski and Hernandez, the TE position for the Patriots was nothing short of a black hole of production. The Sports Illustrated cover boy, LaGarrette Blount, turned into a wrecking ball as the season rolled on, closely resembling the player he was in his breakout year in Tampa. You’ll hear a lot about him this week. He runs downhill, sheds would be tacklers like he was covered in butter, has a nasty stiff arm that resembles swatting flies, and somehow, even though he’s 250 pounds, outruns safeties and linebackers. He’s a monster. The transformation of the New England Patriots from a Brady-centric, pass-happy team into a balanced team that could run you into the ground as well as throw over your head is nothing short of jarring, and Blount is the key. There were lots of close calls during the Patriots season, with tight, late victories over the likes of Buffalo, NYJ, New Orleans, Denver, Houston, and Cleveland, where the Patriots seemingly snatched victory from the jaws of defeat. But that’s an easy narrative to make: that they were lucky in a lot of those games, and should have blown out the likes of Houston and Cleveland. But a closer look at their schedule reveals a key feature of this version of the Patriots: they were in every single game. their four losses were all close affairs. They never let a game get away from them early. On November 24th, 2013, when the Denver Broncos came into Foxboro, you could have confused it with Antarctica. Gillette Stadium was a sea of blankets. It was the type of night you’d figure would favor the Patriots, as Peyton Manning’s reputation in the cold is less than stellar, to say the least. But Peyton was barely necessary. The Patriots turned the ball over their first three possessions, resulting in 17 free points for Denver. The game looked over before it got started. Peyton Manning studies film and opposing tendencies like you or I eat or breathe. It’s not something that should surprise you, seeing as how every news and sports outlet has analyzed this to death over the past 16 or 17 years (depending on whether you want to count his last season at the University of Tennessee). But there shouldn’t be anything earth-shaking about that. Shouldn’t every quarterback study film and tendencies? I’ll bet Tom Brady and Drew Brees spend just as much time in the film room as Peyton does, and when Eli finishes watching Sesame Street each morning, he gameplans for his opponent like a champ. But Peyton Manning’s entire career is based on being logical and prepared. He’s got a strong arm, but he doesn’t have the cannon of Brett Favre, or even his little brother. He has the mobility of a scarecrow. But the man KNOWS what the defense is going to do to him. Every time. And he has a plan do deal with it. If Peyton decides on Wednesday that he’s doing to throw a rub route crossing pattern to Decker when the opponent shows single coverage across the board on third and 4, then dammit, he’s going to check to that call. It’s like clockwork. I’ve jokingly wondered whether Peyton has an original call at all. Sometimes it feels like he just orders a formation, changes it immediately at the line, then he spends the next 30 seconds bullshitting and making fake calls, deftly slipping the actual play in once he determines the best plan. It’s quite frustrating when you’re an opposing fan to watch him look like he’s an air traffic controller between every play, especially when you know 90% of his gyrations are decoys. “OMAHA! OMAHA!” No matter how you feel about his plan, recognize it works for him, and it’s made him an all-time great. Peyton eats defensive coordinators and opposing coaches for breakfast. He studies them meticulously until he knows the most efficient way to defeat them, and from there, he becomes the hammer and they become the nail. Peyton Manning has a winning record against 29 of 32 teams. You can forgive his record against Green Bay and Indianapolis, as he’s barely played against them over the years. But not New England. He’s had plenty of shots against Belechick’s defenses. Since Tom Brady took over for the Patriots in 2001, Peyton Manning is 4-10 in head to head matchups. 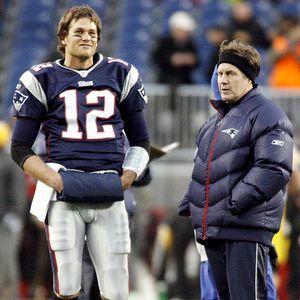 What does Belichick do to frustrate Peyton Manning so? He finds what Peyton wants to do, and takes advantage of it. 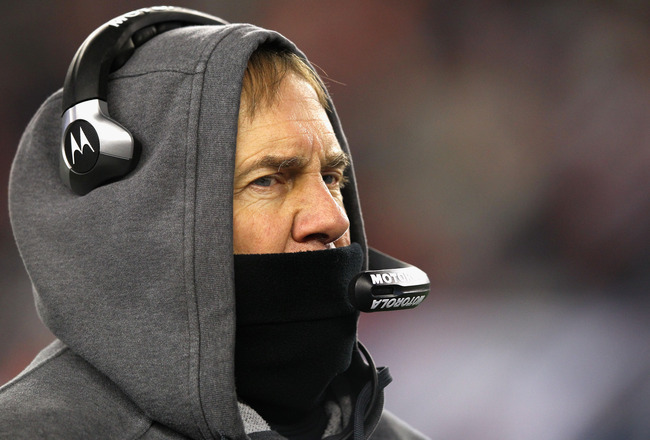 Instead of running scared from Manning’s acumen, Belichick uses it against him. Early in his career, Peyton made a living off short routes off the line, setting up intermediate and deeper routes down the field after drawing the defenders in. Dallas Clark, Reggie Wayne, Marvin Harrison and co. all worked in perfect harmony with Edgerrin James’s pass protection, catching out of the backfield and short runs. The offense was effective and beautiful to watch, and predicated on two things: receivers getting clean releases off of the line of scrimmage, and calling runs when the defense loaded up the box. So imagine how enjoyable those games against the Patriots were for Peyton when Ty Law and co. bumped and pressed his first option every single time he got to the line, disrupting his timing routes and forcing him to anticipate throws that might not be there, and how much fun he must have had going up to the line, seeing 8 men in the box, checking to a pass, then watching the linebackers back off into coverage. The look on Peyton Manning’s face the first time he saw the famous “walk around” defense, where all eleven Patriots stood and roamed until the snap, must have been priceless. Bill Belichick owns Peyton Manning. Back to November 24th. The Patriots were outmanned on defense. There was no way they could match up with Thomas, Decker, Welker, and Thomas without dropping too many men into coverage without letting the run gash them. So what did Belichick do? Exactly that. A stroke of genius. Postgame, Aquib Talib confirmed the game plan: Sit back. Double cover the main receiving threats. Put extra defensive backs in the game. Peyton played right into Belichick’s hands. It was like Groundhog Day: he waked up to the line, checked out of the original call, and ran the ball. 5 yard gain. Walk up to the line, check to the run. 10 yard gain. Repeat, repeat, repeat… until there’s a holding call. Or one of the linemen get beat. All it takes is one mistake, and oftentimes, it forces a punt. The Patriots took a huge, yet calculated, risk: they let the Broncos run the ball at will. The final numbers are staggering: 48 rushes for 280 yards. Knowshon Moreno had the game of his life, carrying the ball 37 times for 224 yards. But therein lies the problem: Moreno had 37 rushes, and Peyton had 36 passing attempts. When you’re Peyton Manning, and you’re probably going to go down as the most prolific passer of all time, you should have the ball in your hands more than Knowshon Moreno. Because of the persistent rushing, mixed with the cold weather and ferocious Patriots defense, Peyton never got in a rhythm, and never seemed comfortable in the pocket. When finally forced to throw, he looked lackluster. The first Broncos drive in the third quarter epitomized the problem: Run, Run, Run, Run, Run, Screen pass in traffic fumble, Patriots recover. The 24-0 lead at the half evaporated soon after. As the Patriots clawed back into the game, the Broncos did nothing. They got plenty of yards, but yards do not equal points. The Broncos drives in the second half: Fumble, Punt, INT, Punt. After Brady led his team to 31 straight points, it fell to Peyton, suddenly down a touchdown, to come back and answer. Which he did. They drove right down the field and tied it at 31. They pass-run ratio was 9-2 on that drive. We all know what happened in overtime. Belichick took the wind instead of the ball after winning the coin toss, which was one of those “so crazy it’s genius” moves, further playing mind games with Peyton. And in what was the most predictable outcome ever, the Broncos drive stalled and they punted. You didn’t expect Peyton to play the hero and drive it right down the field and score, did you? What ensued was the dull punt-fest for ten minutes until something actually happened. And what an occurrence it was: Patriots turncoat Wes Welker called all of his Broncos teammates off of a punt that he should have fair caught. His timidity resulted in one of those funny bounces that always seems to happen when someone plays scared. It went off a backup Broncos corner, Pats recover, Gostkoswki drills the field goal, and then comes the aforementioned gridlock on Route 1 in Foxboro. What a game. But the teams look a lot different now. Rob Gronkowski, who had a dominant second half in that game, is unable to play (presumably out break dancing somewhere while he recovers from surgery). Massive blow for the Patriots, as he is uncoverable sometimes and turned the tide in the first meeting. But Von Miller, who started the avalanche of turnovers and sacks in the first half for the Broncos, and was equally as unblockable as Gronk was uncoverable, also won’t be around. So they pretty much cancel each other out: Brady won’t have his best target, but he’ll also have more time to throw. We all know this game comes down to how Peyton Manning performs. It won’t be cold at Mile High this time. 58 degrees is downright balmy for a conference championship game. This suits Peyton well. The key has to be whether Peyton takes Belichick’s bait again: will he audible into exactly what the Patriots want him to every time, or will he step up and be the hero and throw against unfavorable matchups? He did just set every significant passing record this year, didn’t he? Time to go out and prove that he’s got every argument to be named the greatest of all time. He didn’t show it last week, in a lackluster performance against the Chargers. 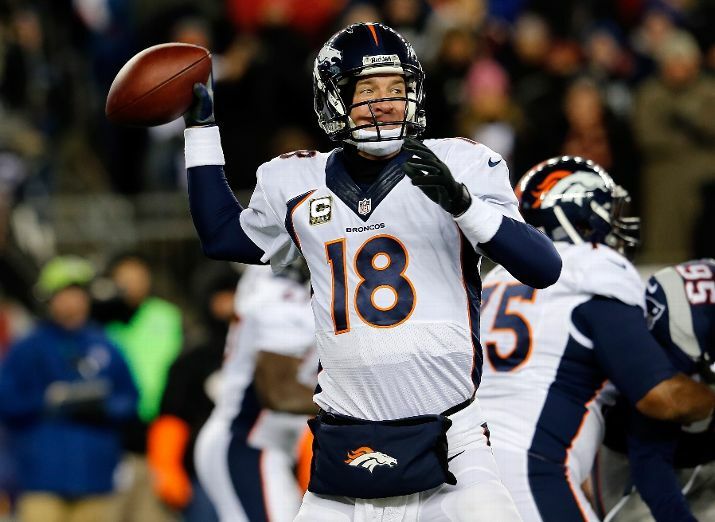 For the most part, Peyton Manning shrinks when the pressure is on. He has a losing playoff record, and a losing record against the Patriots. But he can still point to the 2006 AFC Championship Game as the one time he stuck it to the Patriots. He overcame a huge deficit in that one and ended up getting his first, and only, Super Bowl ring. Will this look more like that, or like just another Manning vs. Patriots game, where he inevitably blows it? I think this goes according to script. How can I bet on Peyton Manning in a big game? Sure, he has the capability to win, and it wouldn’t shock me if the Broncos pulled it out, but come on, this is Peyton vs. Brady/ Belichick. I’ve seen this episode before, and it doesn’t end well for Peyton Manning.